To me the holidays mean gathering together with family and friends -- sharing stories and cooking. With my extended family spread around the country, that usually means hosting people at my own home. I've spent the last week frantically preparing for the much-anticipated arrival of our visitors -- cleaning out spaces in our home for them to sleep and planning special meals for them. Our house is the "small house" variety designed for energy efficiency in a small footprint so we don't have multiple spare bedrooms that provide the luxury of privacy. While I scramble to create some semblance of comfort and privacy for our guests, I've been pining over these guest cabins, built in our small-house-building class. One of these little structures would be an ideal guest space; allowing our visitors to stay with us but also providing them with a quiet space to sleep so our girls don't wake them in the middle of the night and at the crack of dawn. And the cabins can be shut down completely so we don’t need to heat them at all when our guests are not visiting – so it won’t have a major impact on our long term energy use. Happy Thanksgiving and while you're enjoying the holiday with family and friends, consider how fun it would be to have a little guest cabin right next to your home!Slideshow of construction of a Shelter 12x16 Small House. Shelter currently has one such small shell waiting to be turned into a quiet retreat for guests, a writing or artists studio, a great escape, workshop or first structure on your property ideal to live in while building your real house. They are just under 200 square feet, often not requiring a permit. The printed price for these insulated shells is $10,000 but because of the backlog we’re cutting the price in half! The kit includes structural framing, rigid foam panel walls, Marvin Integrity windows, a Therma-Tru door, a metal roof, and vertical board siding. The $6,000 sale price of the kit (FOB Shelter Campus) comes with a set of plans and instructions for assembly. Our crew is available to deliver the shell to your site and even raise it if you need us to. Call today for pricing on additional labor or to reserve your insulated small house shell today! 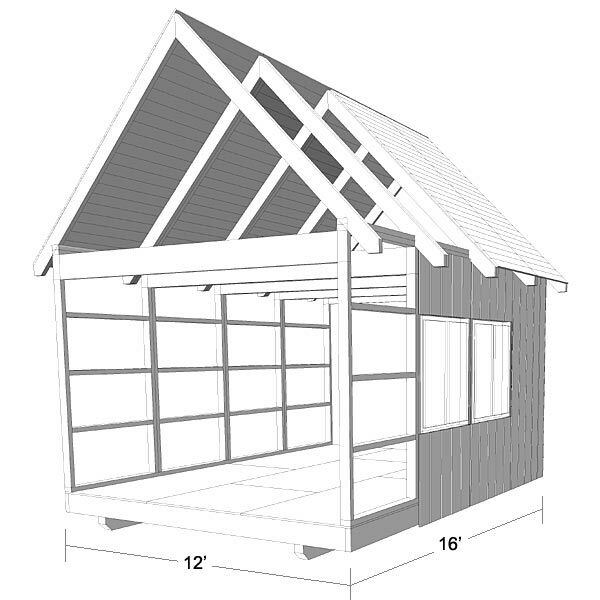 And if that price tag is still too high we have one 12x16 shell that does not include the windows, door and metal roof. This shell, comprised of the framing, rigid foam insulated panels and vertical board siding has a special sale price of $3000 (FOB Shelter Campus). Sale prices available while supplies last. Small is beautiful . . . This is one trend that continues to gain momentum. Home owners relish the low cost of heating and cooling, cleaning and furnishing, maintaining and updating small structures. We've had so many inquiries about SMALL houses that we've designed a new 14x20 kit to add to our two existing Hennin Post Beam Kits - The 20x30 and The 24x24. All three kits are designed to expand in length very easily and cost effectively. 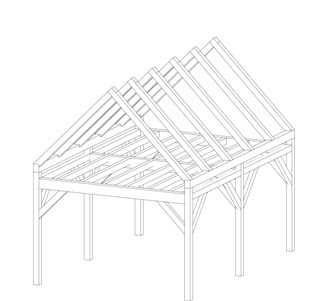 Remember that the kit options are finite—designed to give base pricing and get you started with a design, but a timber frame can really take on any shape or style to fit your project. If you've taken the Design Build Class you'll remember that a kit option is a great way to help you nail down your budget and identify basic costs. 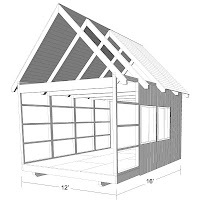 Use our numbers to get started, and you may find that one of our kits will come in handy for that addition, outbuilding or small first structure on your property. Below is a collection of some of our favorite small houses that we've built or that past students have built over the years. If you have photos, ideas, or questions about small houses that you'd like to share, send us an email. If you are trying to develop a design to fit your specific needs, let us know, and our in-house design staff and engineer can help you develop your ideas for design and construction. Click on the link below to see the slideshow in a larger screen. If you recently took this class, please write a comment here and let us know what you thought!